Cancer is an independent and major risk factor for venous thromboembolism (VTE) [LEVITAN1999] [HEIT2000]. Venous thromboembolism (VTE) is defined as deep-vein thrombosis (DVT), including catheter-related thrombosis (CRT), and pulmonary embolism (PE). VTE occurs in 4 to 20% of cancer patients. In hospitalized patients included in the National Hospital Discharge Survey (USA), the rate of VTE was 2% in patients with cancer and 1% among patients without cancer [STEIN2006]. Although the association between cancer and thrombosis has been known since Trousseau’s first report [TROUSSEAU1865], cancer care providers now have increased awareness of the impact of thrombotic complications in patients with cancer. Several factors have contributed to this heightened awareness. Firstly, cancer-associated VTE is increasingly prevalent. 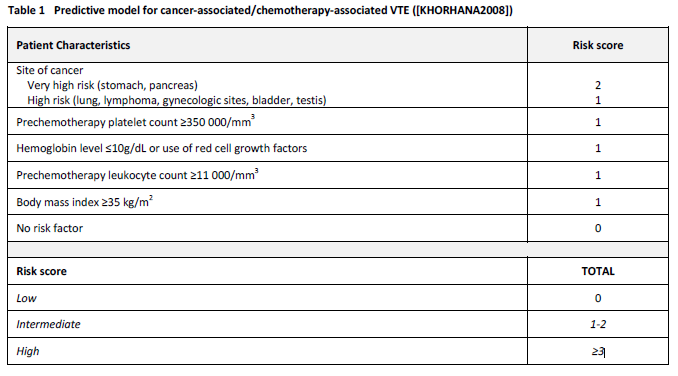 In an analysis of more than 1 million hospitalized patients with cancer, the rate of VTE increased by 28% from 1995 to 2003 (p <0.0001) [KHORANA2007]. In an exhaustive review of the literature, the frequency of symptomatic catheter-related thrombosis was 5%, a figure subsequently confirmed in prospective clinical trials [VERSO2003] [DEBOURDEAU2009]. Secondly, the consequences of VTE are better understood. Thrombosis is the second-leading cause of death in patients with cancer [KHORANA2007A]. 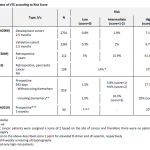 Furthermore, VTE is an independent prognosis factor of worsened mortality in cancer patients. Cancer patients with VTE have a shorter global survival than cancer patients with similar tumoral stage and anti-cancer treatments but without VTE. Among 1 211 944 patients with cancer, global survival was 6% in patients with VTE compared to 58% in subjects without VTE [LEVITAN1999]. In a study of 235 149 cancer patients included in the California Cancer Registry, adjusting for age, race and stage, diagnosis of VT, was a significant predictor of decreased survival during the first year for all cancer types (hazard ratios, 1.6-4.2; p<0.01) [CHEW2006]. In addition, patients with cancer who suffer from VTE have an increased risk of recurrent VTE, bleeding complications, morbidity, and utilization of health care resources [PRANDONI2002] [ELTING2000]. In this last study, 525 of the 529 patients with venous thromboembolic events were hospitalized for initial anticoagulation therapy, for a mean of 11 days. The mean cost of hospitalization was 20 065 US $ [ELTING2000]. 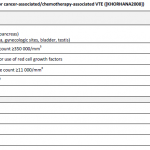 The high incidence of VTE in cancer patients is due to the presence of various simultaneous risk factors: the underlying neoplasm (histological type, stage and site), type of surgery, hospitalization, presence of a central venous catheter, and use of chemotherapy and/or erythropoiesis stimulating agents (ESA) [BOHLIUS2006] [BENNETT2008] [MARECBERARD2009]. The risk score for VTE was derived from a development cohort of 2701 patients and then validated in an independent cohort of 1365 patients from a prospective registry. The stageadjusted multivariate model identified five predictive variables. 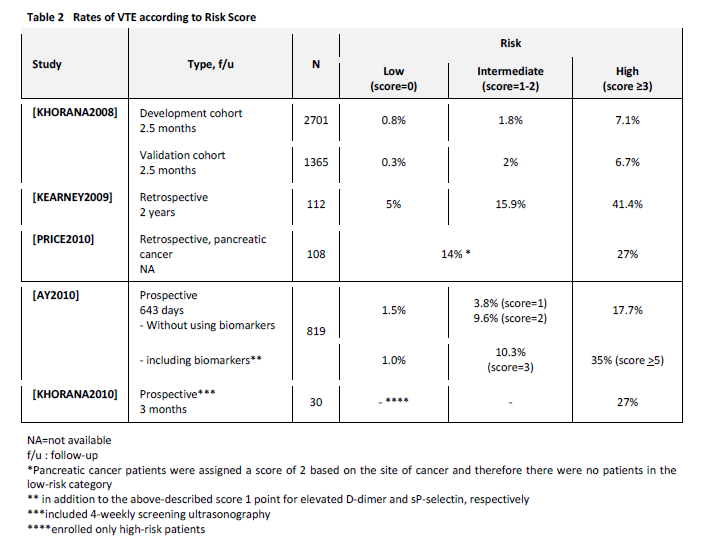 Observed rates of VTE in the development and validation cohorts were 0.8% and 0.3% in the low-risk category, 1.8% and 2% in the intermediate-risk category and 7.1% and 6.7% in the high-risk category, respectively. This model has now been externally validated by the Vienna CATS study in 819 cancer patients [AY2010]. The 6-month cumulative probabilities of developing VTE in this study population were 1.5% (score of 0), 3.8% (score of 1), 9.4% (score of 2) and 17.7% (score ≥3). 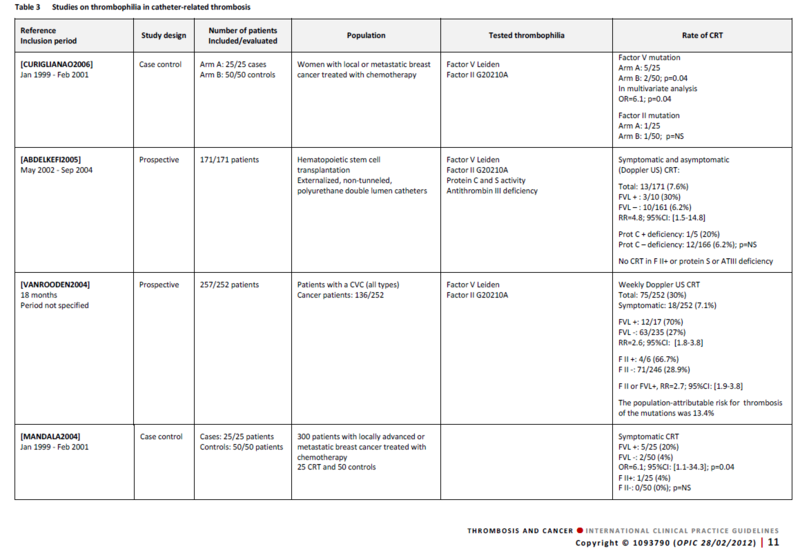 Several other retrospective and prospective studies have further validated this risk score, although rates vary between studies because of differences in patient selection and follow-up periods (Table 2). been widely achieved with the D-dimer test, but still has to be further confirmed for the sP-selectin. Several risk factors for CRT have been identified in cancer patients. Risk factors that are related to patient’ characteristics and to catheter insertion modalities were studied in these guidelines because of their clinical consequences. 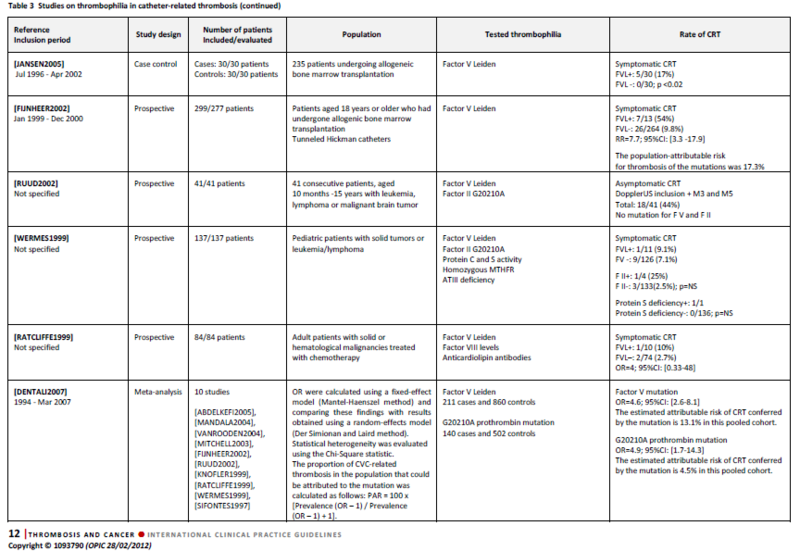 Conversely, different types of thrombophilia are associated with CRT in cancer patients without any clinical implications (see Table 3) . attributable risk of CRT conferred by the presence of factor V and factor II mutations was about 13.1% and 4.5% respectively in the meta-analysis by Dentali et al. 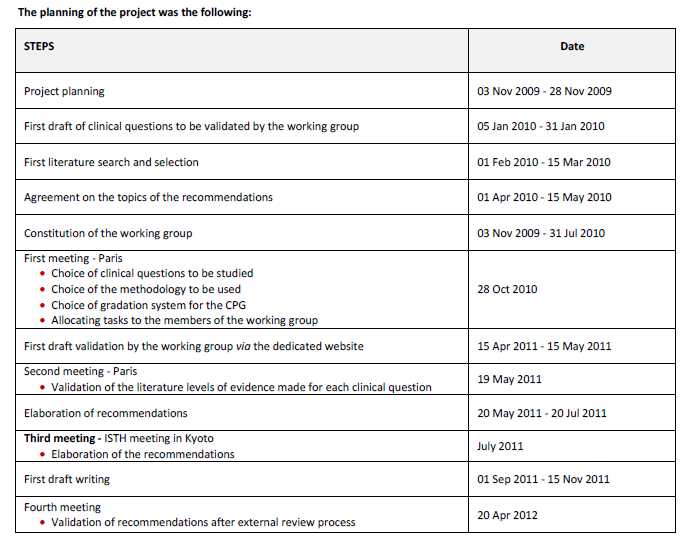 [DENTALI2007], but their clinical consequences cannot be assessed in the absence of dedicated studies. Similarly, few studies have analysed the respective incidence and role of protein S and protein C deficiency. Venous thromboembolism (VTE) is a major therapeutic issue in cancer patients. VTE is an independent prognostic factor and a leading cause of death [KOHRANA2007A]. published or are about to be published, which will further inform our practice. 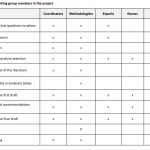 guidelines on the subject were established using various methodological approaches. 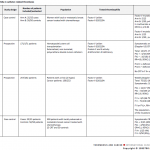 – the National Comprehensive Cancer Network (NCCN) [NCCN2011]. also issued for the treatment of VTE in multiple myeloma patients [PALUMBO2008]. 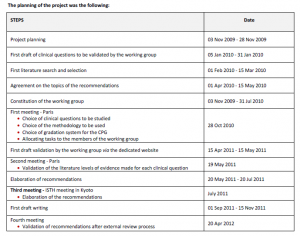 to be assessed [KHORANA2007] [FARGE2010], the final recommendations were similar. practice and the implementation of specific recommendations for cancer patients is still low in daily clinical practice. 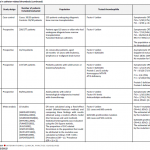 VTE in cancer patients requires a multidisciplinary approach, but downstream of guidelines publication, the potential organizational barriers to applying these recommendations have not been discussed. – to study clinical questions that are unanswered. account to elaborate a recommendation that was cheaper than another one. Presidential Fund, and the French Institute of Cancer (INCa). international guidelines according to INCa methodology. of course cover every single subject. 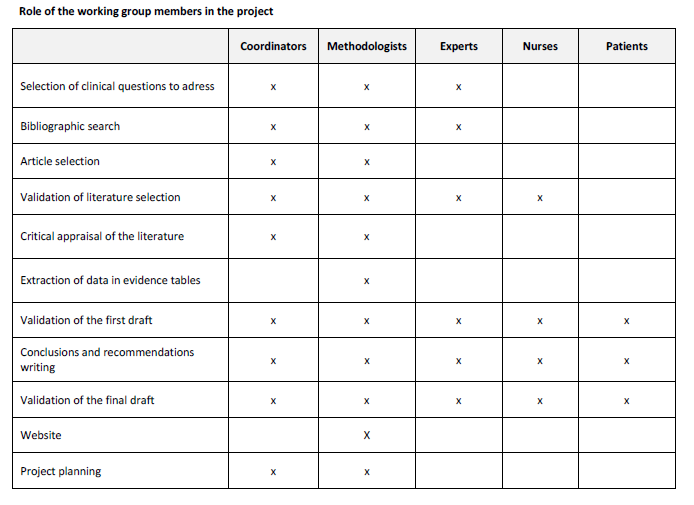 · to set up a collaborative website for the working group dedicated to the project. These guidelines will be updated every 4 years.